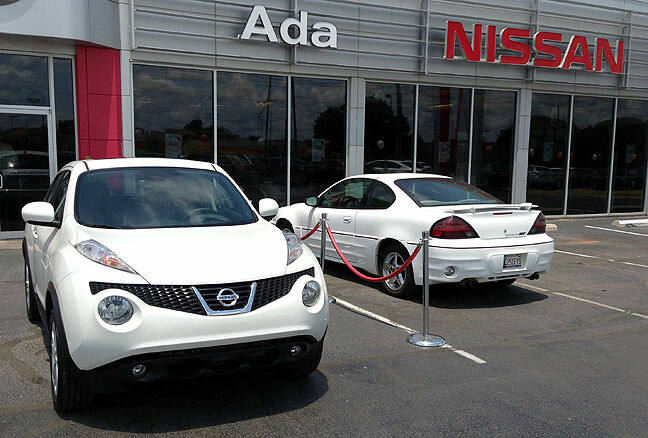 This is our Nissan Juke with Jean Claude Grand Am the day I got the Juke two years ago. I realize that one needs to keep rain out of your car, but something inside me tightens when I see a car I once loved treated this way. Giant Muh readers recall that I celebrated my 52nd birthday yesterday. Readers will have to reach far deeper into their memories to recall that two years ago Abby and I bought a Nissan Juke, which I have since decided is my all-time favorite car. Someone recently asked me to summarize why, and I explained to them that it was a perfect fusion of what I need from a car: a small, nimble, good-looking sporty car with a measure of soft-road all-wheel-drive capability and good fuel economy. My readers might not recall that when I bought the Juke, I traded in a car I’d owned for 10 years, Jean Claude Grand Am. Between work and personal use, including a number of jaunts out west, I rolled up 174,000 miles on it. Since it was 10 years old, and despite the fact that I’d taken great care of it, Ada Nissan decided to sell it to a local “buy here, pay here” car lot. 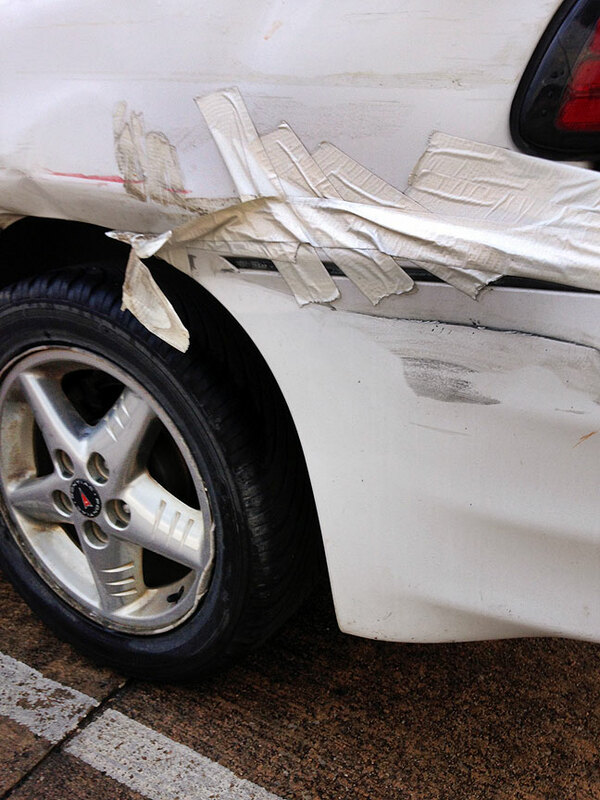 White tape is better than silver duct tape, but it’s still not pretty. I catch a glimpse of Jean Claude on the street periodically. I can easily spot it by its two plugs in the trunk lid where my amateur radio antennas were mounted. This morning it was in the public parking lot behind my office. At first I hesitated to walk over and check it out because a crazy woman, who seemed to be nursing a sack of garbage, was walking in circles around it, but when she wandered off, I checked it out. Jean Claude’s condition has deteriorated quite a bit. I can’t say that I’m surprised, since I realize that Abby and I take better car of our cars than most people. I saw an Ada High School parking permit hanging from the rear view mirror, so I guess it belongs to a high school kid. When I was in high school, I drove my dad’s cars, but by college, I had a 10-year-old Volkswagen. I took much better care of my VW than is Jean Claude’s new owner. 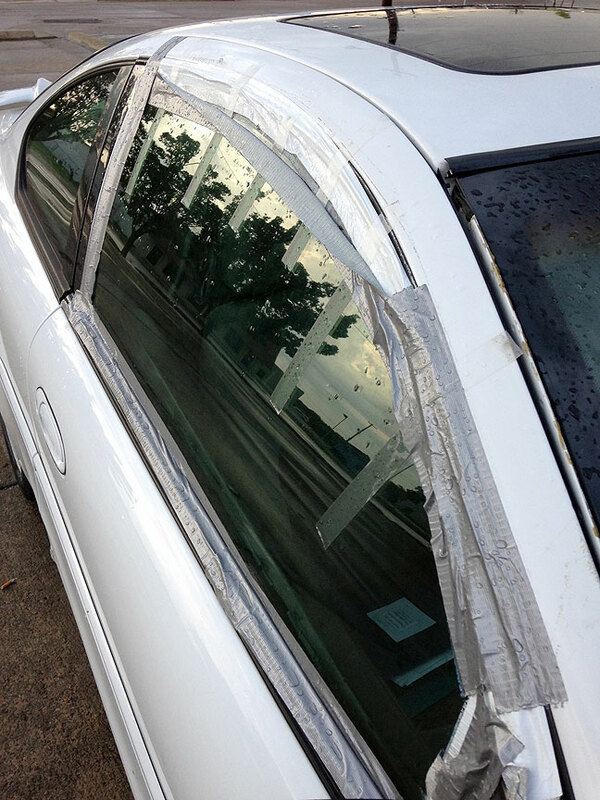 I don’t know what it takes to damage a door panel like this, but I’m guessing it was noisy. Iceberg! Right ahead! It’s the only explanation. 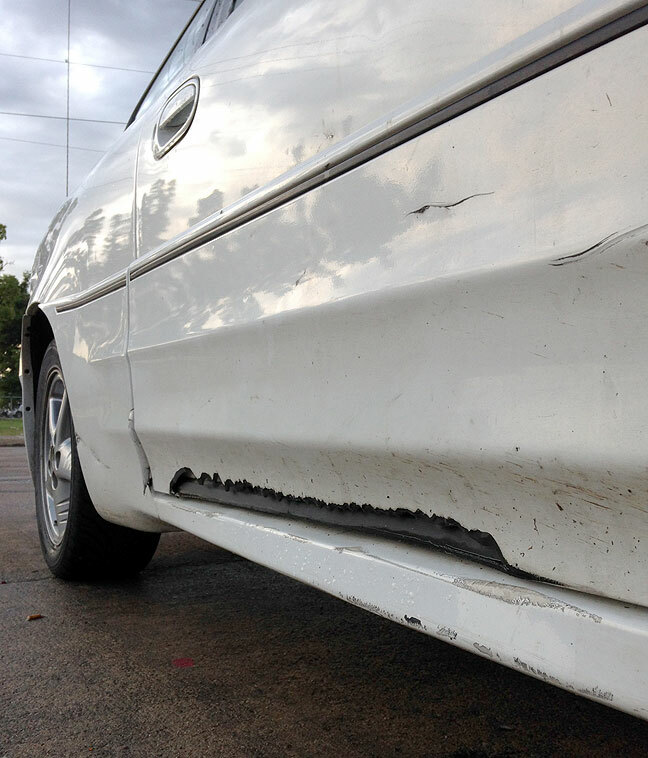 I don’t take terrific care of my cars, beyond religiously changing the oil, but…I cannot stand a damaged body. It makes me feel poor and reckless. I could never be one of those people who takes the insurance money and spends it on something else, leaving behind a crumpled fender or taped-on side-view mirror. Hammill, on the other hand, seems completely untroubled by such things. The lid to his center console? Came off after having stuck to my forearm recently. That, and one can no longer open the passenger side door from the outside. So we need some advice. What’s a good vehicle that’s large enough to carry a 4′ by 8′ piece (the size of most signs) but no bigger than that so as to avoid gasoline guzzelry? It’s time for a new (well new to us) vehicle for him. Our dream machine is a brand spanking new Ford Transit Cargo Van, in blue, but that’s more than we can spend. Remember that little old lady from Poltergeist? She was in some other movie — maybe Ferris Bueller’s Day Off? — and every time she walked, she squeaked and rattled? Hammill’s current conveyance sounds JUST LIKE HER.